Syncios is free iOS and Android mobile manager which offers you ultimate solution between smartphone and windows PC, helping you easily transfer, manage and backup multimedia data including music, video, photo, Ebook, apps, contacts, notes, whatsapp, bookmark history between iPod/iPhone/iPad, Android device and PC. There are more functions of Syncios to better manage your devices, such as online video downloader, iPhone ringtone maker, hany audio & video converter, etc. Transfer all files including music, video, photos, ringtone, ebooks, Podcasts, audiobooks, TV Shows, MV, voice memos, iTunes U between mobile phone, tablet and PC. 1. Connect your mobile device to PC via USB cable. 2. Under My Device tab, choose the items you would like to manage from Media, Photos, Ebook, Apps and Information. Choose the operation to backup data from iPhone/Android to PC or copy from PC to cellphone without iTunes. Note: Pro version support automatically converting and importing downloaded videos to your iOS devices, just tick "Automatically transfer to current device." 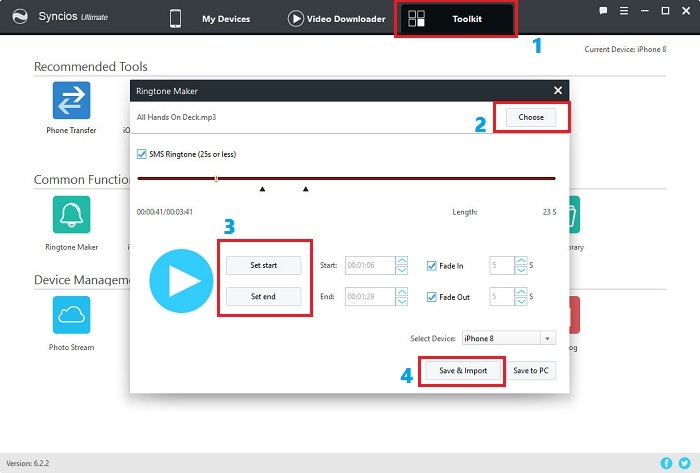 before downloading, it also allows you to select the download quality, output video format, video size, conversion quality. 5. Click Convert button. 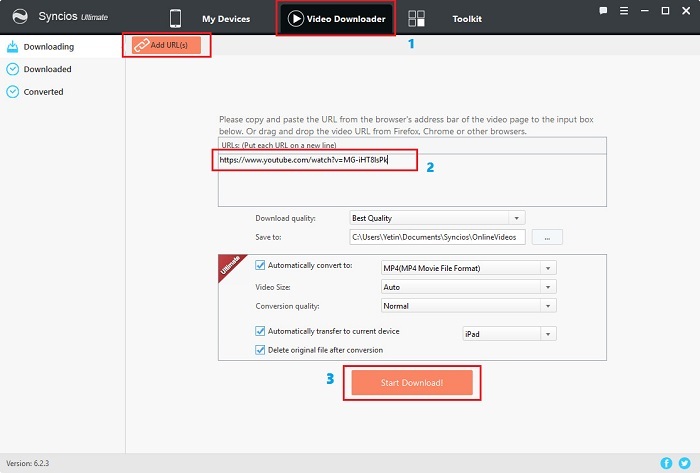 Choose output video format and the video conversion output location. 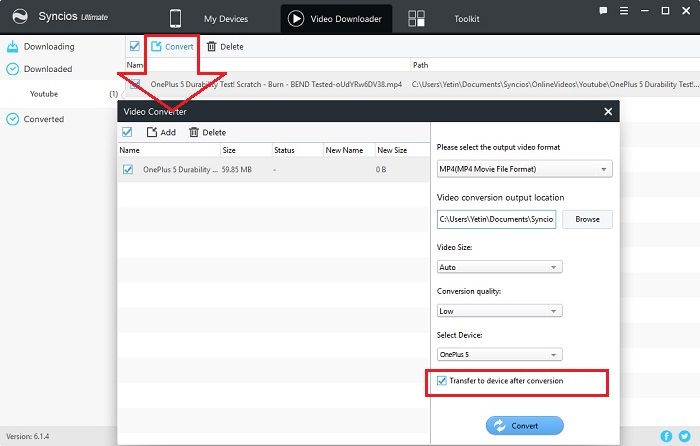 If you would like to transfer output video file to connected device automatically, please simply check the option: Transfer to device after conversion. 4. Choose Save & Import button Syncios would convert your ringtone and then import to current device shown on the upper right corner automatically. Choose Save to PC button you can simply save the output ringtone to your local computer.